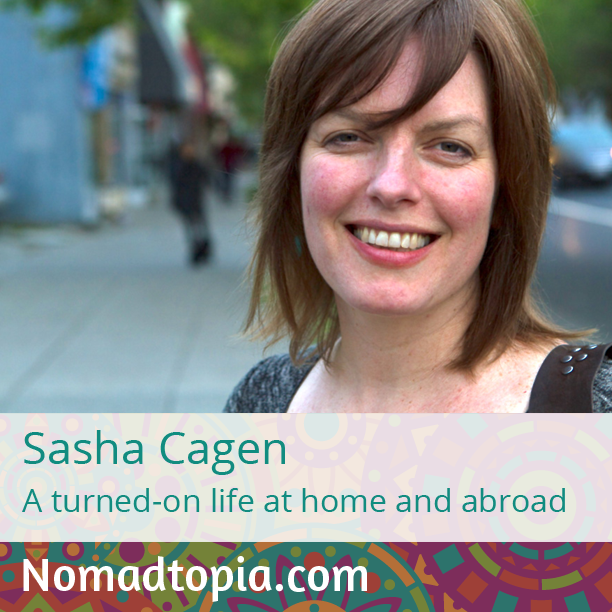 Writer and coach Sasha Cagen’s life looks very different than it did five years ago. Tune in to find out how she went from co-founder of a Silicon Valley tech startup (and creator of the Quirkyalone movement) to leading tango adventures in Buenos Aires and writing a memoir called Wet. Hosting the Tango Adventures in Buenos Aires, and finding such fabulous friends in Buenos Aires. It’s not easy. That’s not really a surprise, but it takes a lot of work. Also, I thought this lifestyle might be a problem with developing a long-term relationship, but I find that my current partner is much more accepting than I thought he would be. I love it Amy! I got the chance to say so many things that I have not said out loud yet because I have been squirreled in my own head writing and these are so the things I want to share with my readers and the community at large. Thanks for a great interview! I used Earth Class Mail when I didn’t have an address in the U.S. years ago, and it was great! They have since added more services (like check detection with automatic deposit!). Sasha, it’ll be great to have you back in Buenos Aires! That’s great to hear about Earth Class Mail, Paul. Another one I’ve been looking at is Traveling Mailbox. So glad services like this exist! Thanks for sharing your friend’s observation, such a great point. I can vouch for everything Sasha said and more! She really takes everything to 100% and more to encourage her friends to be more of themselves. She makes discovering yourself such a rewarding journey that you can’t help but jump in with both feet. I use several of the exercises she taught us in Get Quirky to keep myself progressing forward. That’s great to hear, thanks for sharing, Carissa!